InstruNet is a family of data acquisition modules designed to give the flexibility and convenience of distributed devices with the speed performance of data acquisition PC cards. It comprises a controller card which is either in PCI, PCMIA or USB format, and range of distributed signal conditioning units that connect to a wide range of sensors. The external modules contain signal conditioning amplifiers for each channel, and can directly attach to thermocouples, RTD's, strain gauges, resistance sources, current sources, and voltage sources. Measurements are made in engineering units . The controller cards handle all the real-time activity thus removing the load on the host computer. Each controller card can operate up to 8 InstruNet Inet-100 (signal conditioners) devices at a distance up to 300m from the host PC. The Inet 100unit provides 8 differential or 16 single-ended Analog Input channels. It also has 8off Analog outputs and 8 Digital Input/Output bits. Sensor connection is via screw terminals. The iNet-100B unit provides 8 differential or 16 single-ended Analog Input channels. It also has 8off Analog outputs and 8 Digital Input/Output bits. Sensor connection is via screw terminals with 16off BNC connections also available for the Analog Inputs. The iNet-100HC unit provides 8 differential or 16 single-ended Analog Input channels. It also has 8off Analog outputs and 8 Digital Input/Output bits. Sensor connection is via screw terminals. The iNet-100HC unit has voltage outputs that have 15mA/.01uF drive capability, useful for energising sensors such as Strain Gauges. Complete High-Speed InstruNet 400 Series USB 2.0 Starter system for Windows XP or later. 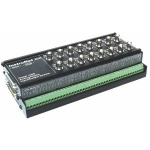 This package provides an off-the-shelf monitoring solution for most sensor types and offers: 8 Differential or 16 Single-Ended individually configurable Analogue Inputs, 4 Voltage Outputs and 4 Universal Digital I/O channels. The Inet-200 PCI instruNet Controller board fits into a computer 5V PCI slot to interface to InstruNet data acquisition systems. The Inet-230 instruNet Controller boards attach to laptop computers via their PCMCIA slot to drive an instruNet network. The Inet-230 is similar to the Inet-200 Controller card except the Digital I/O channels are not available and it requires an external power supply. Power Supply for Instunet Units. 110/220VAC, 5V/2A, +-12V/.8A, Euro or UK Plug, CE. The iNet-240 instruNet Controller attaches to an USB 2.0 port to drive an instruNet network. The iNet-240 requires an external iNet-312.8 power supply. The Inet-330 Electrical Isolator provides 1000 Volts of optical isolation at one point within an instruNet network.